If you'd like to register or transfer to a Magenta Health physician, please complete the following form. We'll use the information submitted to validate your OHIP. Once this is done, we will invite you by email to schedule a new patient intake appointment with a particular doctor (a “meet and greet” appointment). It varies depending on your preferred clinic location. See the form below for more specific and up-to-date information. Completing this form is the first step to become a patient of one of the family physicians at Magenta Health; you do not automatically or immediately become a patient. Instead, you’ll be invited to have an intake appointment with a particular doctor first. Only at the end of that appointment, should you decide to proceed, will you become a patient. can I register just my child? Otherwise, our standard policy is that we do not accept infants or children under 5 years of age unless at least one parent or guardian is enrolled as a patient as well. Please also fill out the form for your child if you decide to start the registration process for yourself. No. Kindly note that it is not an option to switch locations or physicians after you have had your new patient intake appointment. I prefer a doctor at the Midtown (Avenue & Eglinton) location. I prefer a doctor at the Beach (Queen & Woodbine) location. I acknowledge the likely timeline for booking my intake appointment. I prefer a doctor at the Riverside (Queen & Broadview) location. I acknowledge the likely timeline for booking my intake appointment. I have no preference between the Riverside (Queen & Broadview) and the Beaches (Queen & Woodbine) locations. I have no preference between the Riverside (Queen & Broadview) and Midtown (Avenue & Eglinton) locations. I have no preference between any of the locations. 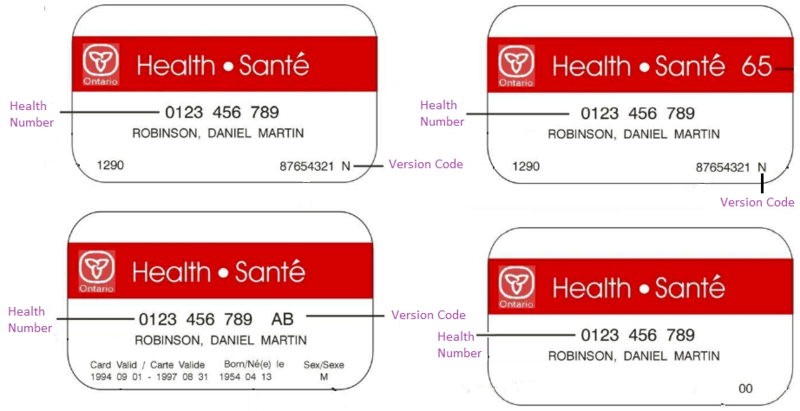 The following images explain what your health number and version code are, for different health card versions. It is important that this information be provided to us correctly so that we may properly validate your OHIP.